In planning for massive open online courses or collaborations (MOOCs), I often think about the dynamics of self-direction in a peer learning context. How do you get learners actively driving their own learning experiences? It’s not as easy as it might appear. At the P2PU School of Ed, we’ve played with this quite a bit with varying degrees of success. We’ve tried “hack the syllabus,” design your own activities, and other things. Nothing has worked well consistently. Participants just don’t seem to find this natural. In my experience, K-12 teachers in particular have been discouraged from doing this so often that when they are asked to self-direct their professional learning, they are often unable or unwilling to do so. Then I found DS106. The assignment bank there was a whole new brilliant paradigm. Participants were submitting a wide variety of creative content as a part of this community course. When a group of us were outlining the Making Learning Connected MOOC (CLMOOC), we puzzled over how to encourage participants there to help shape the assignments. Not wanting to reinvent the wheel, we modeled a Make Bank after the DS106 assignment bank (with much thanks to Alan Levine, Martha Burtis, and Jim Groom and the DS106 community). 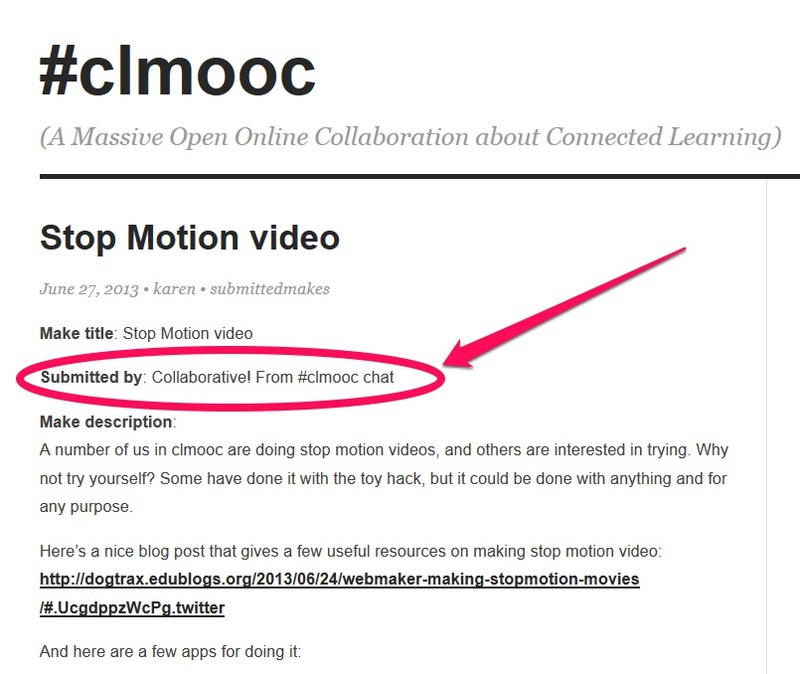 CLMOOC is about making, and we wanted the community to be able to “make their own makes” with the Make Bank. Technically, this was fairly straightforward. Using WordPress as our content management system, we set up Gravity Forms as the front end to capture user-generated data. The entries from this then generate WP posts (they could also be set up to generate WP pages), which are then held for moderation. Once they are approved by a moderator, they automatically post using a designated category. We then used the list category posts plug-in to publish them all to a given page. In another similar implementation, we put a search box and tag cloud right on the main page using the widgets on pages plug-in. Another thing we did that really worked well is to include a Gravity Forms field to allow file upload (in this case images). Credit Paul Oh for that idea. It really made the whole thing more interesting and useful. Technically, I love this approach of using a web-based way to populate a database. I’ve been looking for something like this for a while and have already put it into use on another project. I think I’ll use this for all kinds of things in the future. From a learning standpoint, I love this model of peer content/course/collaboration development. It seems to be working better than other things I’ve tried. Three weeks into this MOOC and we have had about 45 “makes” submitted. One of the lovely developments is that some makes have been collaboratively developed on (via Twitter chats or hangouts). It’s core to the collaboration/course content. We’re all about makes and options for makes. I’d love to hear others thoughts about this. We’re always iterating! Encourage participant creation especially in terms of their “course”/learning experience. Experiment. Try new things and see what works.